Babysitting is an important job. You need safety and life skills to take care of and protect children. In this American Red Cross Babysitter's Training course, you will learn basic care giving, how to make good decisions, accident prevention and age appropriate play. The course is fun and fast-paced with hands-on activities, exciting video and lively discussions. You'll learn to be the best babysitter on the block. Plus, you'll gain the confidence to make smart decisions and stay safe in any babysitting situation. Impress parents by earning your Babysitter's Training certificate! Please bring a pen/pencil, note paper, and lunch to class. Course fee includes American Red Cross Babysitter's handbook and certificate. 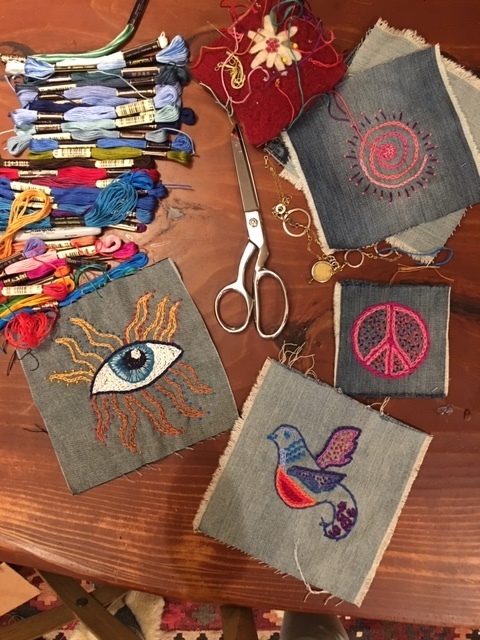 In Intro to Fashion Design participants will learn how to use a sewing machine, sew from a pattern and have the opportunity to epicycle and embellish a pair of old jeans. Projects will include, PJ Bottoms, Denim Bag/Backpack, Denim Apron or Dress. Bring your ideas and lets see what we can create together! Learn basic embroidery stitches to create patches or embroider directly onto existing clothes. All supplies, patterns, tracing paper, threads and needles will be provided and are yours to keep. This workshop is suitable for all levels. Transform an old pair of jeans into a denim skirt and embellish with embroidery. Bring an old pair of jeans (even if they are a bit small); all other supplies will be provided. Be prepared to create a one-of-a-kind fashion statement with vintage lace and fabrics provided. Sew polar bears from felt. This sweet craft brings awareness to the plight of the Arctic Circle and the future of Polar Bears. Mama bear carries maps and tools to find a new home.